Catarrhal stage, lasting for about 10 days. Paroxysmal stage, lasting for anything between two to four weeks. Convalescent stage, lasting for about one to two weeks. The illness generally lasts for about six to eight weeks. The chief complications of pertussis are bronchitis and bronchopneumonia. 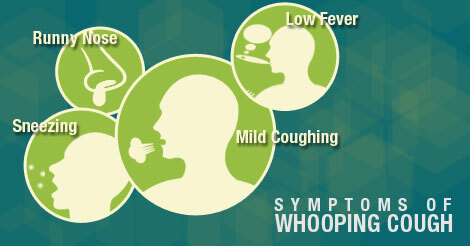 Early diagnosis, isolation and treatment of cases, and disinfection of discharges from the nose and throat are the general principles of control of whooping cough. Early diagnosis is possible only by means of bacteriological examination of nose and throat secretions. The patient should be isolated until considered to be non–infectious. Erythromycin is probably the drug of choice. Infants and young children should be kept away from cases. Those known to have been in contact with whooping cough may be given prophylactic antibiotic (erythromycin or ampicillin) treatment for 10 days to prevent infecting bacteria to become established. The national policy is to immunize against diphtheria, whooping cough and tetanus simultaneously, by administering three doses (each dose of 0.5 ml) of the DPT vaccine intramuscularly, at a one to two months’ interval, starting when the infant is about six weeks old.